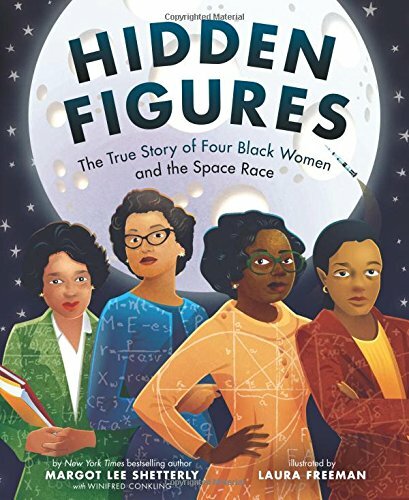 Margot Lee Shetterly uses the repeating phrase, “really good” throughout this true story of four women working for NASA in the 1940s and beyond. They were called computers back then, because people did the math that today’s computers do for us. The story starts out with Dorothy Vaughan. She worked for the government agency that designed airplanes. Then the book turns to the subject of segregation and how it was to be a black woman in the ’40s. Then the story moves on to Mary Jackson, who worked at Langley. She helped test model airplanes in wind tunnels. She became an engineer after she got permission to take math classes at an all-white high school. The third woman discussed is Katherine Johnson. In 1953 she worked on a team that tested actual planes while they were flying in the air. She asked to go to meetings until they said yes. Then the story goes back to Dorothy and how she learned to program the first computer machine at Langley. The following pages discuss Sputnik and President John F. Kennedy’s announcement that man would land on the moon. But first an astronaut needed to orbit the earth. John Glenn did so in 1962, using Katherine’s math to land safely. Then the book discusses early integration. Christine Darden started working at Langley in 1967. She helped with NASA’s mission to the moon. The end of the book shows a timeline for the four women along with NASA’s accomplishments. There are mini biographies of the four women at the end. The glossary follows and an author’s note, too. This book takes on big issues and hard-to-understand projects. Explanations are clear and age-appropriate. The art shows slide rules, airplanes, calculations, and space illustrations. Laura Freeman makes it as colorful and interesting as possible. The segregation/integration double spreads are the most engaging. To see the word “colored” over a drinking fountain will provoke some discussion from young readers. One clever double spread shows architectural blue prints as the floor that the female computers are walking across. The lower right-hand corner has the words “white dining room.” The right-hand page has white women walking away from the black women on the left-hand page. Another double spread shows two white men peering at Mary Jackson as she leaves Hampton High School with her notebooks. The illustrator’s palette is primary colors, with pops of yellow and red throughout the book. The endpapers are white stars on navy. Aside from one subject/verb agreement issue and plural pronouns used where singular pronouns would be correct, the book is a competent addition to any school bookcase and a great help for girls to write biography reports about females that are not president’s wives.